Home Styles Create-a-cart in a black finish with a 3/4 inch Cherry finished wood top features solid wood construction, four cabinet doors that open to storage with three adjustable shelves inside, handy spice rack with towel bar, paper towel holder, and heavy duty locking rubber casters for easy mobility and safety. Size: 48.75w 17.75d 34.75h. Assembly required. Home Styles Cuisine Kitchen Cart in a cherry finish with a black granite top features solid wood construction, and Utility drawer; 2 cabinet doors open to storage with adjustable shelf inside; Handy spice rack, Towel bar; Heavy duty locking rubber casters for easy mobility & safety. Size: 32.5w 18.75d 35.5h. 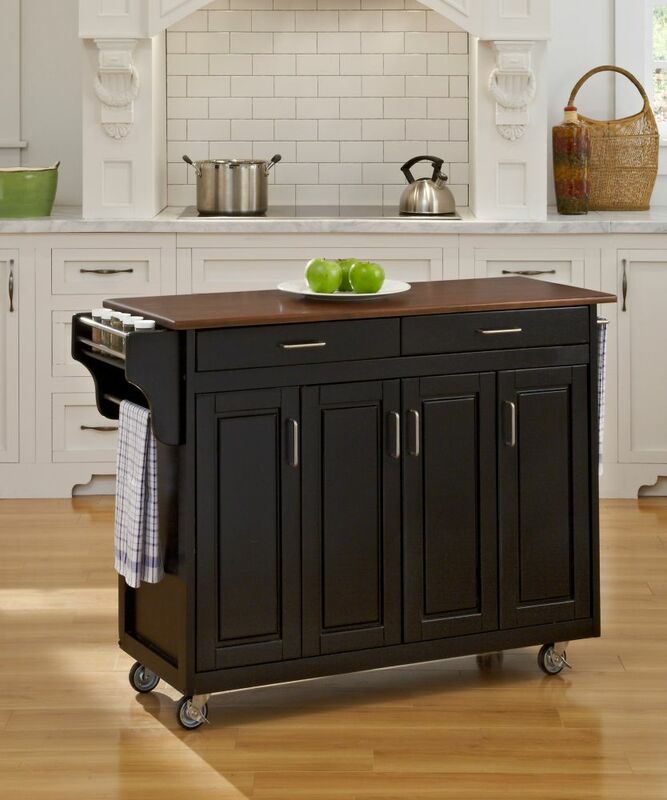 Home Styles Create-a-Cart in a Black finish with a stainless steel top features solid wood construction, four cabinet doors open to storage with three adjustable shelves inside, handy spice rack with towel bar, paper towel holder, and heavy duty locking rubber casters for easy mobility and safety. Size: 48-3/4-inch W x 17-3/4-inch D x 35-inch H.
Create-a-Cart Black Finish with Cherry Top Home Styles Create-a-cart in a black finish with a 3/4 inch Cherry finished wood top features solid wood construction, four cabinet doors that open to storage with three adjustable shelves inside, handy spice rack with towel bar, paper towel holder, and heavy duty locking rubber casters for easy mobility and safety. Size: 48.75w 17.75d 34.75h. Assembly required. Create-a-Cart Black Finish with Cherry Top is rated 4.0 out of 5 by 1. Rated 4 out of 5 by SarahRose from Great for small kitchens I brought that product because I needed more counter space and storage in my small kitchen. And boy is it working out great! I just love having it and since it’s on wheels I can move it whenever I want too. That’s only thing that is not perfect about it is the drawers. They don’t quite line up right but they do still close. The quality of the materials really doesn’t seem cheap at all. It is a very good buy in my option! Also it’s not too hard to put together!